Not sure if this is a fixable one or how the real 717 handles VOR intercepts as part of an instrument departure but the 717 is drawing a SID out of Alice Springs (YBAS) completely wrong. The SID is the PULOL TWO departure and calls for a straight out departure out of runway 30 tracking 295 degrees, then at 3600' right turn heading 120 degrees to then intercept the 100 degree radial out of AS (Alice Springs VOR). @turbofandude @Joshua Che. another example. 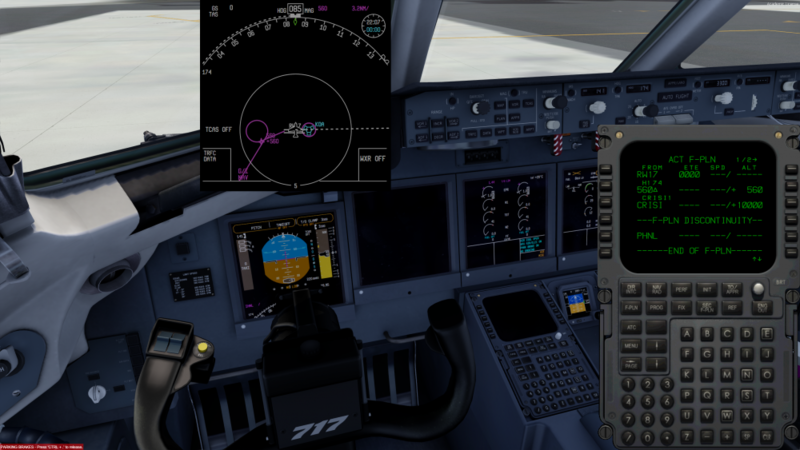 This is the CRISI ONE RNAV departure out of PHKO. The departure calls for a climb on runway heading then a turn at 560 feet direct CRISI after a departure from either runway 17 or 35. The 717 is drawing the northern climb fix (i.e as if you are departing from runway 35). It should draw a fix south of the field for a runway 17 departure, no? EDIT: Actually, I just tested setting up a runway 35 departure and it's placing the turn fix for that departure south of the field, so it looks like it's reversing the two? Another example, this time PHTO (Hilo Intl) on the PARIS FOUR departure. I departed off runway 26 but it drew a fix on the east side of the airport for the turn. The F-PLN page looks to be ok (climb out on rwy heading, then r/t heading 45 to intercept the R-355 ITO to SADPE) but the visualisation on the ND is totally wrong. Problem linked to bad magnetic database update. Will be fixed in next COB build.